Weleda Almond Hand Cream hydrates and soothes sensitive and reactive skins. Its 100% natural formula rich in Organic Sweet Almond Oil calms irritation, tightness and redness. 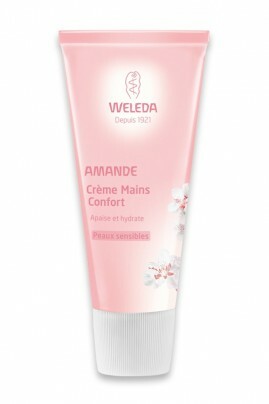 Weleda Comforting Moisturizing Hand Cream is quickly absorbed and provides instant comfort. Your hands are soft, durably soothed and protected ! Use Weleda Natural Hand Cream with Almond anytime you need ! Apply day and night a nut-size of Weleda Comfort Hand Cream on your hands, massage until fully absorbed. Renew the application anytime you feel the need, including after each hand washing.